We are here with another Detective Pikachu card with Charizard-GX (SM Black Star Promos 195). As this is a different Charizard-GX than the other Charizard-GX (SM Burning Shadows 150/147), it clashes with today’s card due to the 4-per-copy rule. I won’t go through the details of the entire attributes, but know that it is a Stage 2 Fire Type with 250 HP, weak to water, and a retreat cost of CCCC, which is perfect for Buff Padding. Giving up 2 prizes is quite a burden, as it means we have to expect this card to be worth the hassle. Looking at three attacks, I don’t think today’s card would make the cut. Raging Destruction costs R and makes you discard the top 8 cards of your deck. If there are any Fire energies that you found from those eight cards, attach all of them to this Pokémon. This is a pretty risky setup move as it can throw away some of the cards that you might need much later on during the match. Steam Artillery and Dreadful Flames both cost RRCCC. The former doing just 200 damage while the latter does 250 damage and discards an energy card from each of your opponent’s Pokemon. Based on what this card does, it is easy to determine if this is playable, and it isn’t. It is WAY inferior than the Burning Shadows counterpart because the selling point of that card is that while it also cost five energy to use Crimson Storm, it does three hundred damage! This is still enough to OHKO any Pokemon in the game, and does exactly what you need to OHKO Magikarp & Wailord-GX, unless it is equipped with Buff Padding. Even Choice Band and Shrine of Punishments combined falls 10 HP short of OHKOing Padded M&W GX. Even if the previous Charizard is about to leave rotation, I still wouldn’t use this card. We’re opening this week with Charizard-GX (SM – Black Star Promos SM195). 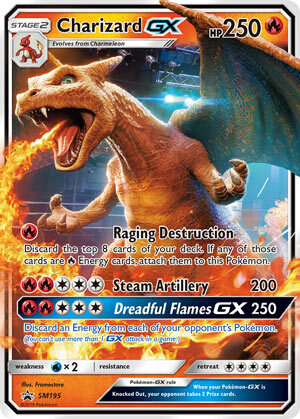 This is the second Charizard-GX we’ve looked at; you can see our review of Charizard-GX (SM – Burning Shadows 20/147, 150/147; SM – Black Star Promos SM60) here. The two have a lot in common, actually. Of course, they share the same name so they count against each other for the 4-Copy Rule. As Pokémon-GX, both have a GX-attack and more HP than a baseline Charizard. They may also be intended to have better effects as well, but that is open to debate. Either way, it also means giving up an extra Prize when KO’d and being targeted by certain effects; a few positive, but mostly negative. The [R] Typing isn’t a huge help right now; while the Type has support, the best of it is in Expanded and doesn’t actually work well (or at all) with Charizard-GX. Still, better to have Blacksmith than not, and you might be able to risk something like a Kiawe in Standard (though Kiawe doesn’t actually care about Pokémon Type). Sometimes the Typing is useful for exploiting Weakness, provided something [R] Weak is big (or damage absorbent) enough to require Weakness for the KO (see the attacks, below). Being a Stage 2 is definitely a concern, though we are seeing a decent amount of Stage 2 Pokémon in the competitive sphere at present. Still, remember how many turns and/or pieces of support are going into each Charizard-GX you manage to field, especially as we look at the rest of the card. Such as it’s HP; 250 HP is sturdy, a difficult OHKO for most decks, and even impossible for some. Which is good, but you are “paying for it” given this is a Stage 2 Pokémon-GX. [W] Weakness isn’t the only reason some decks will be able to OHKO Charizard-GX but is one of them. Thankfully, with the HP, it’ll still require at least a medium-sized attack (130+) to do the deed. No Resistance is the worst Resistance, and while typical, it is a bit disappointing. Especially with how useful Resistance can prove on top of 250 HP, metagame cooperating. A Retreat Cost of [CCCC] is as bad as it gets in the modern cardpool. Charizard-GX needs help to move out of the Active position, so build your deck to do just that and/or to try and let it tank hits. I’m not sure if it is actually a good idea, but the Retreat Cost does mean that Charizard-GX could utilize Buff Padding. Charizard-GX has two regular attacks, in addition to its GX-attack. First up is “Raging Destruction” for [R]. You discard the top eight cards of your deck, and any that were [R] Energy you attach to Charizard-GX (or whatever used Raging Destruction). Only basic Fire Energy cards count as [R] in your deck, so you’re pretty restricted on what you can attach. It also must be attached, and there are times when you don’t want to load up a Pokémon with unneeded Energy… like right before you head into your opponent’s turn, given that Tapu Lele-GX is still widely played. The attack would be much more useful if it worked with any Energy and/or let you attach to any of your Pokémon. Even then, however, I’d be very hesitant to use it; the eight-card range makes it more likely to hit some Energy, but it also makes it more likely to hit something else… like the Pokémon, Trainers and any non-[R] Energy cards in your deck. There’s no cost-effective way to stack the top of your deck with mostly Energy cards, let alone basic Fire Energy. [RRCCC] is the printed Energy cost for both of Charizard-GX’s remaining attacks. “Steam Artillery” simple does 200 damage for this. I appreciate that the cost is majority [C] but five Energy is still very steep. We’re beyond the range that Blacksmith plus a Double Colorless Energy from hand fueling the attack, so while this breaks down to a decent return per unit of Energy required, it isn’t worth the hassle in the present environment. After all, while 200 HP deals with most things, it falls short of some Stage 1 and most Stage 2 Pokémon-GX, as well as all the Tag Team Pokémon. You could use a Choice Band or the like to increase your range, but with everything already going into the attack, it shouldn’t be needed for a competitive attacker. Even with Raging Destruction, this is just too pricey. What about the GX-attack? It is a one-time deal, so the Energy cost might be a bit less painful in practice. “Dreadful Flames-GX” does 250 damage, plus it discards an Energy from each of your opponent’s Pokémon. Some decks flood the field with Energy, but most do not, so the effect seems a bit wasteful, but at least it hits hard enough you’ll OHKO most things that aren’t protected, buffed, or among the biggest Tag Team Pokémon. Individually, Charizard-GX has some nice features, but collectively, I don’t think they are greater than the sum of their parts. The elephant in the room is actually another fire-lizard pretending to be a dragon, Charizard-GX (SM – Burning Shadows 20/147, 150/147; SM – Black Star Promos SM60). Most decks you could build around today’s Charizard-GX are likely to work with the older Charizard-GX as well or better. Its Retreat Cost is only [CC] instead of [CCCC] and it has no single-Energy attack, but for [CCC] it can use “Wing Attack” for 70 (not the worst filler), for [RRRCC] its “Crimson Storm” does 300 damage (though it does have to discard three [R] Energy from itself), and for [RCC] its “Raging Out-GX” can mill a massive 10 cards from your opponent’s deck. The GX-attack is actually pretty great, just too hard to build a deck around. Tag Team Pokémon might make it worth the hassle of meeting Crimson Storm’s cost a few times in a game. Odds are, however, you just shouldn’t bother with either Charizard-GX. We know from Japanese releases we should be getting some more [R] support sooner or later, as well as a Special Energy card that provides [CCC] but discards itself at the end of your turn. These should give today’s Charizard-GX some much-needed help, and without helping the original Charizard-GX more… but I expect it will help various other attackers even more, so I still don’t think we’ll be making use of either Charizard-GX anytime soon. I like the Detective Pikachu-based art, though.